The NHL hasn’t scheduled a game on Christmas day since 1971. The last games played on Christmas eve were in 1972. Since then, there’s always been a break from December 23 through December 25. In recent years, teams have had the 26th off as well. But before 1971 and 1972, playing on Christmas was a regular part of the NHL schedule, almost from the very beginning. In the earliest days of the NHL, the season didn’t start until the latter part of December. The league’s third season of 1919–20 kicked off on December 23, 1919, with Toronto losing 3-0 in Ottawa. 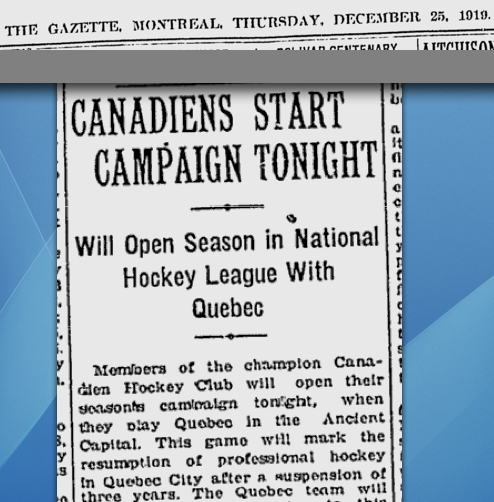 Two nights later, Montreal played its opener in Quebec City in the league’s first game to be played on Christmas. The Canadiens held a practice on the evening of December 24 and caught a morning train to Quebec City early on the 25th. (Happy Holidays!) Apparently not in a giving mood, Montreal jumped out to a 5–0 lead after one period paced by three goals from star center Newsy Lalonde. The Canadiens upped their lead to 6–0 early in the second, and after letting Quebec close the gap to 8–5 midway through the third, added four late goals for a 12–5 victory. Georges Vezina got the win. This was Quebec’s first game in the NHL after the club had withdrawn from the league two years earlier during the meeting that formed the NHL back on November 26, 1917. The lopsided loss on Christmas day set the stage for a season that would see the team win just four of 24 games and withdraw once again. 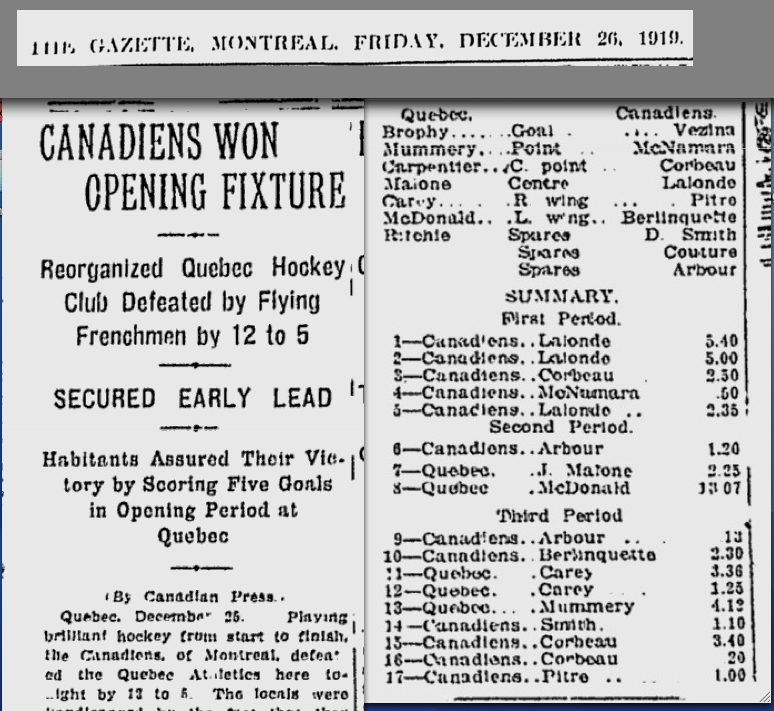 Of added note to hockey historians, the Montreal Gazette in describing the Christmas day game refers to Quebec as the Athletics, not the Bulldogs as the team was known throughout its days in the National Hockey Association. It seems pretty clear that the Quebec Athletic Club operated the hockey team during its lone season in the NHL (as opposed to the old Quebec Hockey Club), but the name Bulldogs can certainly be found in plenty of references throughout the 1919-20 season, plus the team wore the same colors as the Bulldogs, was run by the same people, and employed many of the same old players. Thanks for another interesting read Eric! Interesting box score … no assists nor penalties listed, and defence were known as “point”. Pretty lean rosters as well! The Montreal Gazette wasn’t great with including assists in its summaries, even when other papers already were. Game stories do point out that Quebec only had seven players available! I love thinking of Montreal fans being able to enjoy a hockey game on Christmas Day–but poor players! And it’s not as if they were making the big bucks, either. . .